I’ve made this three times now and am starting to get the hang of it. I especially like that the recipe I started from was very barebones in what spices to use and in what quantity. I probably checked another website to get an idea of what dishes add more of what and less of other things b/c I’m still figuring stuff like that out. However the process is pretty easy and the results are quite tasty. It uses a few more canned ingredients then an ideal meal for me, but since the Kale and Sweet Potatoes I’ve been using are from the farmers market (or sometimes, my backyard) I don’t feel like I’m cheating too much. 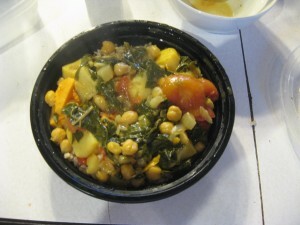 I likely found this recipe just by googling kale recipes because I had so much of it at the end of last year, but found it on Spark Recipes. One of the things I look for is how complicated ingredients are, and how necessary they are to the meal. Anyway, I highly suggest you check out the original recipe, but I cut some things in half and add more then others. 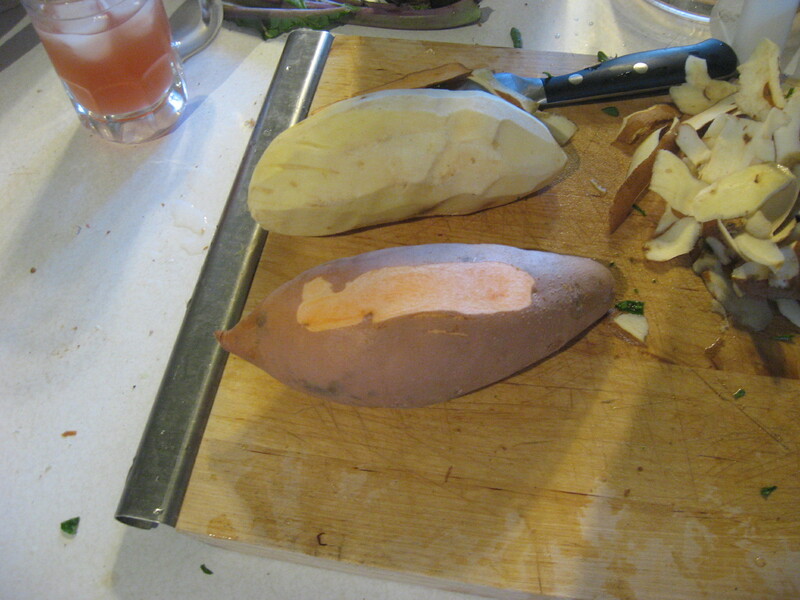 It ends up being mildly sweet w. a nice background spice – I could probably make it a quite a bit spicier and not lose any of the inherent sweetness from the sweet potatoes. cayenne pepper (I use less of this then the chili powder). 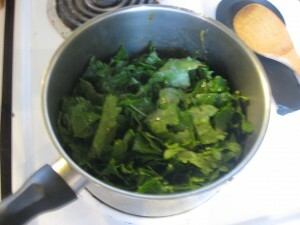 2 1/2 cups kale (more then the recipe calls for, because I always have a ton). Wash, remove the stems, and chop. Prep is easy, although you need to pay a little attention. First, go ahead and stem the kale, cut the onions, and dice the sweet potatoes. 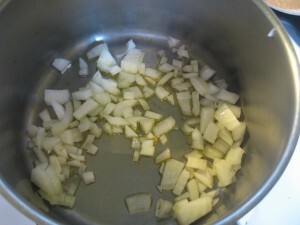 Now, sautee the onions in some olive oil for a couple minutes until it’s tender. Add the garlic and spices and just a little bit of water (around a 1/4 cup – start w. less) and cook that for a few (4 or 5 is fine) minutes. You want enough liquid to simmer the kale in, but you don’t need that much. Go ahead and add the kale in here now – it will start to wilt and take up less space in the saucepan so you don’t need too much liquid in the pan. Reduce the heat, cover and simmer this for 10 minutes. 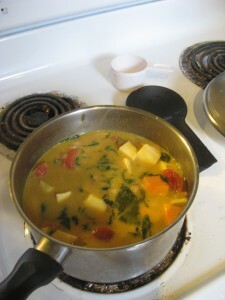 Next, add your sweet potatoes, tomatoes, chick peas, coconut milk, and the honey. You may need a little bit more water here so you have enough liquid to cover the potatoes and make sure they get cooked. If you have stock to add, I would use that instead though. (always use stock instead of water!) Increase the heat just a touch and simmer for 30 minutes or so, stirring occasionally. You want the sweet potatoes to be soft but not mushy. Everything else should retain it’s texture (I’ve worried about overcooking the kale before but it’s come out fine) in that time period too, providing you are just simmering. And that’s it! I serve over brown rice, but I serve almost everything over brown rice.